How effectively is Tesla selling solar in its stores? In 2014 SolarCity was the largest residential solar installer in the world. CEO Lyndon Rive had set a goal of reaching 1 million solar customers by July 4, 2018, and SolarCity's green trucks filled the streets of solar-friendly states. Unfortunately, that dream is dead. Elon Musk's car company acquired/rescued SolarCity in late 2016 for $2.6 billion in stock and the assumption of approximately $3 billion in debt. Sunrun has replaced SolarCity as the leading third-party-ownership financier. And solar installations have plunged at Tesla. The visible remains of SolarCity have been relegated to a few square feet in low foot-traffic areas of Tesla automotive dealerships. 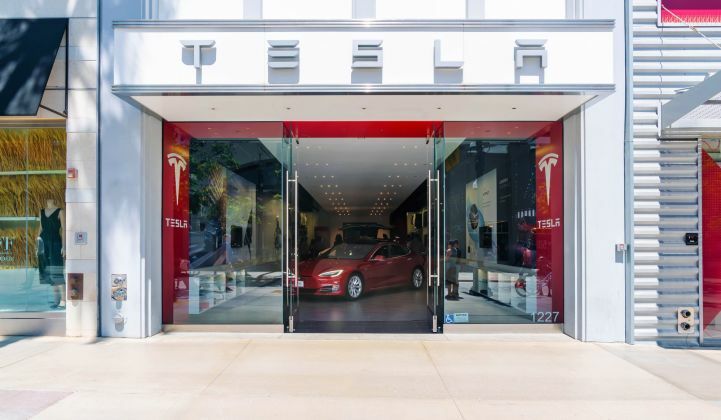 GTM visited some Tesla stores to understand the new Tesla solar buying experience and how it might stack up against the traditional solar sales effort. Tesla's solar sales strategy has completely changed. SolarCity's door-to-door sales channel (with an average customer acquisition cost of $4,500, according to GTM Research) was dropped, as was its in-store partnership with Home Depot (with its customer acquisition cost of $7,000). Tesla laid off 9 percent of its workforce in June of this year and the solar group has seen its own additional layoffs and facility closings. As of now, Tesla is selling solar (and energy storage) exclusively at its retail locations and online. The firm hopes to grow solar sales at its more than 80 Tesla stores with the "cross-selling potential" between its vehicles and its residential solar and battery products. GTM visited Tesla showrooms in five Silicon Valley cities: Sunnyvale, Palo Alto, Stanford, San Jose and Burlingame. This region is a hotbed of Tesla ownership, as well as blind fealty to Elon Musk. Once in the stores and after a little searching, you'd find a solar panel on display at every automotive showroom, except one. The stores had the Powerwall residential battery on display, as well. After surprising the staff as a walk-in inquiry for solar (it didn't feel like an everyday occurrence), we were told to speak to the resident energy adviser. In one case, the adviser was out of the building and staff took our name and vitals. We received a follow-up email the following day. In the other shops, a salesperson or energy adviser asked a few smart questions: What type of roof? What utility? How much is the monthly electric bill? All advised bringing in a copy of the electric bill. Answers varied on the minimum monthly electric bill needed to make solar work — from $60 to $90 per month. Lead time from customer sign-off to system-on was three to four months due to permitting and inspections. The actual installation would take one to two days. They could run the numbers with and without storage. A salesperson pulled up my address on Google Maps, scoped out the shade situation on two of the living structures and made some recommendations. Another salesperson said she could have a crew take a look at the place this weekend. She dismissed the idea of roof tiles being available anytime soon. Although I was often confronted by a phalanx of hungry car salespeople, the solar sell was low-key, and staff and salespeople, to a soul, were total pros. The cost for an installer to acquire a residential customer in the U.S. has actually risen — increasing from $0.41 per watt in 2013 to $0.52 per watt in 2016 ($3,668 per customer) even while the cost of every other component in the cost stack has plunged. The average cost of winning a solar customer in the U.S. is a ridiculous 17 percent of the total PV system cost, according to Allison Mond, senior solar analyst at GTM Research. Customer-acquisition costs are significantly higher for larger solar installers. How do these numbers stack up against customer acquisition costs in another industry? Only 4 percent of the purchase price of a car is used to cover sales and marketing, according to Attila Toth, the CEO of PowerScout. Tesla deployed 84 megawatts of solar systems in Q2, an 11 percent increase over the previous quarter's 76 megawatts. As a point of reference, SolarCity installed 272 megawatts in the last quarter of 2015. Cash and loan sales made up 68 percent of residential deployments in the quarter, a remarkable jump from 37 percent in the same quarter last year, according to the company's earnings letter. Tesla expects solar volumes to remain "relatively stable." Tesla's integrated solar roof is not expected to ramp production until the end of 2018. Tesla as trusted solar brand? Selling residential solar is immensely difficult. It's always a custom project that involves drilling into people's homes and roofs, complex pricing structures, sophisticated technology, along with a challenging permitting process. That's why it accounts for roughly 20 percent of total system cost. Selling exclusively through its showrooms and online is a big risk for Tesla — but it has to be better than the door-to-door business. If Tesla can get you into the showroom, its salespeople can offer an Apple Genius Bar style sales experience. That's new for solar. Tesla could become a trusted name in residential solar and might be able to shave down customer acquisition costs — if it can just get you into the showroom. But until wealthy walk-ins swarm the industrial sections of Burlingame and Sunnyvale, Tesla is going to try to rely on its rapidly growing customer base. In practice, that means asking the new owner of a $35,000 Tesla Model 3 that cost the customer $60,000 to kick in another $25,000 for a solar/storage system. That sounds like a tough sell even for the Tesla true believers.